If you are looking for an electronic coyote call from a great brand, that is durable, cheap, and effective, look no further than the ICOtec GC300. 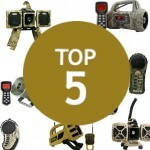 Although the price tag shouldn't be the primary factor in choosing the best electronic coyote call, it is certainly good to get a good deal. In terms of entry level coyote calls, you can't do better than the ICOtec GC300. It comes in at the price of an entry level electronic predator call, but boasts features like those you'd get from a $200+ electronic caller, without all the bells and whistles and extra features of that higher end price tag. If you need an electronic call that works well in all situations - predator calling, prey calling, bad weather, snow (tough condition because it muffles sound) - why pay $200 when you can get it at a sub-$100 price? To put it bluntly, in most cases electronic calls of the same brand/series all have similar base functions. The ICOtec GC300 is the little brother of the GC350 and GC500, both of which have some more advanced, extra features that you might prefer. For example, the GC350 and GC500 both allow you to program in your own calls, which is definitely a great feature that I've written about in other articles on my site. The GC350 and GC500 also have larger storage capacity, but in terms of power, sound, and wattage, they offer no advantage over the ICOtec GC300. Why buy the ICOtec GC300? Can play two sounds simultaneously; so for example you can mix a whitetail distress call with a coyote howl for maximum effectiveness during your hunt. 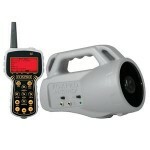 120 db, 15 W speaker for awesome sound out in the field. 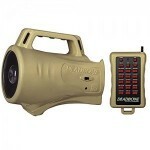 Although there ARE definitely calls louder than the GC300, this one will satisfy the needs of most hunters. If you don't need programmability and a large library of predator and game calls, this unit will satisfy all of your needs at a low price tag under $100. The ICOtec GC300 is very portable and light due to its durable composite plastic exterior, making it a great choice for virtually any terrain. The remote works up to 300 yards away and the call itself operates on batteries, so if your call dies out on a hunt, you can simply swap out the dead batteries for new ones. This is definitely preferable versus having to end your hunt and go home to recharge the caller. The ICOtec GC300 is a highly durable, effective entry level unit that backs in to a price well below $100. 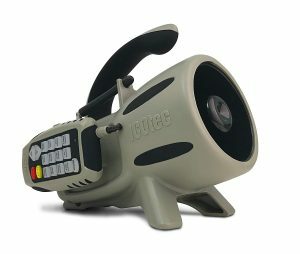 With its 12 different calls and 15W speaker, this electronic coyote call will easily satisfy the needs of most hunters. However, there are certain features that are missing -- most prominent is the lack of programmability. This isn't a feature that comes cheap, so new hunters probably won't be looking for it anyways. However, if you do want programmability, check out the ICOtec GC350 or GC500. 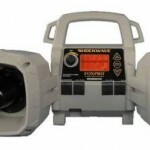 In our opinion, this is the best and most reliable entry level electronic call for the price.